A new and improved version is officially live! The free version has multiple new options for different metrics. Your settings should now sync between devices. The Pro version now supports multiple locations, severe weather alerts, precipitation alerts and many other features coming soon. If you’ve previously donated, please send me a message using the extension contact form and you’ll be updated to pro. Thanks for all the feedback. I’ve made several improvements. Please leave a comment if you find a bug. Added additional detail when hovering on a tile. Leave a comment below if you have any questions, feedback or a bug. Added extension after Lifehacker article. Icon shows hours til sunset/ sunup, not temp. Under options I have it set to Fahrenheit and MPH, yellow temp color, but that has not changed anything. Also, Avast gave me a warning that this extension has a poor reputation (with no details.) What gives? What do you mean MPH? Are you sure you installed the right extension? Is it this one? The extension is new so that is why Avast gave you a warning. The code is open source and your welcome to review. Can you reply with a screenshot of what you’re seeing. Thanks! Sorry if I wasted your time, I had downloaded a similar looking forcast.io extension. Now I have yours – works great, Bought you a coffee. No problem. Glad it working. Thanks! Does your “location” feature include Zip+4 locationing? The reason I ask is that I live on an island and the weather is quite varied across the entire zip code. My home is on the coast whereas the zip code I’m associated with, is centrally located further inland. I realize I’m being a little bit picky, but after all, I believe my OCD is an atribute. Thanks for the feedback. Without any address did the extension find you right location? It should find your longitude/latitude automatically. What is your 4 digit zipcode? Tim, what I mean by Zip+4 is the zip code formatted as: 12345-1234. The weather within my 5 digit zip code is several miles away and the temperature is several degrees different than my specific location along the coast. A 9 digit zip code is more accurate. Give the extension a try and let me know if you run into any problems. Thank you for this app! Installed with no issues. One feature I would like to see (am I missing something?) is the predicted high/low temp for the current day. Maybe in tiny print below the current temp? Glad you like it! Right now it doesn’t show but I can definitely add it. Thanks for the feedback! Thanks again for the awesome app. As a bug report, I opened Chrome a few hours ago, and I noticed that the icon overlay temperature was listed as 72 degrees (it was in the low 80s at the time). About 10 minutes ago, I noticed that it still showed 72 degrees. Only after clicking it, and waiting for the popup content to populate, did the icon update to show the correct temperature (86). Thanks Ryan for the feedback. The extension checks for updates every 30 minutes and updates the badge icon. Does that answer your question? It doesn’t seem to have done that earlier today, where it was 72 when I first opened Chrome (real temp was in lower 80s), and then it was still 72 hours later, until I clicked the icon, and then it updated (to 86). Additionally, the icon image hasn’t changed at all today. it’s the default(?) sun/cloud/rain one and has been all day, even though it says it’s Mostly Cloudy right now in the popup. Really helpful. Especially when I’m at the desktop, instead of reaching for my phone. Really like the small popover window. Thanks so much! Good extension, thank You ! Cool extension. One thing – the ‘Options’ seem to be greyed out when right-clicking on the extension itself. Am I missing something? So, currently I am shown the temp in F but I want to configure it as C, but can’t…any ideas? Ah, ignore me – posted too quickly. Have worked out how you’ve set up the options. Slightly confusing that Google give you ‘Options’ for the extension…but I guess I now understand. Ok yea I chose a different location for options. I’m not using the standard options link. Open up the extension and in the top right corner you’ll see a gear. That’s where you set settings. Let me know if this helps. Can you remove and reinstall? Love it! Just one comment on the design. All weather symbols in the app are in stylish black and white but the toolbar icon is in color. Please add the option to have a monochrome toolbar button. Much clearer! Thanks! I’ll work on adding this. Any chance you can add option for humidity? Sure I’ll add it to my list of improvements. Thanks for the feedback! Yes I plan on doing that when I make several updates. Thanks! Thabks I’m glad you like it! I plan on adding themes and different icons. One suggestion: instead of a Celcius/Fahrenheit switch, how about an Metric/Imperial setting instead, which would also change mph to km/h and miles to kilometers (along with F/C, of course) ? As a non-American user, I would love that. Thanks Phil! I like that idea. I’ll add it to my list of feature request. Awesome work. Sometimes I have trouble reading the temperature. I can’t tell if I need new glasses or the numbers are a bit small or not crisp. Also, have you thought about adding alerts so the icon changes color when there is an alert? Red for warning, Yellow for watch, Blue for none. Thanks! Are you on windows or mac? I’ve thought about changing the icon color depending on temperature but I could also do something for alerts. Thanks for the feedback! Windows, but I have a Mac and will see how it looks. I’ve tried adding my address and zip code, but the App keeps showing the Hills of Lakeway. They are about 15-20 minutes from where I live. Is there a way to get the temp for my zip code? It’s 78734-3428. We sit up higher and it is hotter here then at The Hills. My Thermometer is showing 101 right now in the shade. I do like your App though. It sure beats Weather-bug. Thanks for the feedback. You should be able to enter your zipcode or leave it blank and the extension will try find your location automatically. For 78734-3428 I get Lakeway, TX. Is that not right? I’ve been watching https://github.com/timleland/WeatherCE and see that you haven’t updated it since v2.9.3 (10 days ago). Are you moving away from your open source model? Or just haven’t gotten around to committing your recent changes? I see your icon with the temperature at the top of the screen. However, when I click the icon, I see either a tiny upper left corner of your window or nothing at all. Can you email me a screenshot of what you are seeing. What operating system are you using? Do you have location severed turned off at an operating system level? I ran across something very puzzling/interesting as I was attempting to add a location. Irkutsk Irkutskaya oblast’ appeared under Locations. As I never knew this city existed, I know I didn’t enter it. Consequently I’m curious as to how this occurred. Thanks for any info regarding this. Hi Tim! Really like your Weather extension. Any chance you could create an option to display the “feels like” temp in the toolbar icon (instead of just the air temperature)? I’ve tested a half-dozen such extensions and yours is the only one that seems to realize that feels-like temp could be important, now if I could only see it in my toolbar, I’d be a happy person! That’s a great idea. I’ll plan to add it. While I’m submitting wishes… 🙂 Would it be possible to have some sort of (slider?) 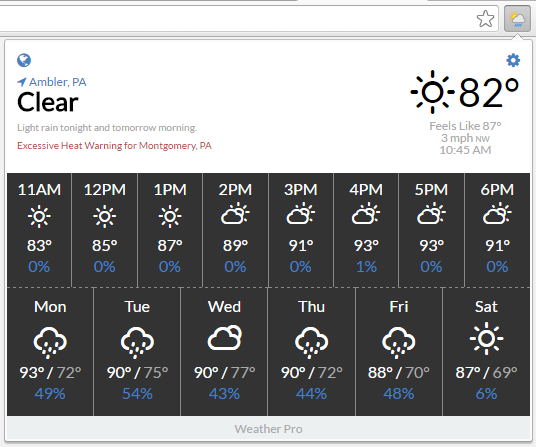 control to change the relative size of the weather portion vs. temp digits portion of the toolbar icon? At the moment, the “sun” image I’m seeing occupies about 3/4 of the total icon area and the temp is in the bottom right 1/4. I was thinking of something which would allow me to make the temp digits larger (to help my aging eyeballs) and the weather image portion smaller. (I kind of know what shape the sun/cloud/et al. images will be, so they don’t need to be as large as they are — for me, anyway). The pro version has an option for a large temp icon that should solve this issue. Thanks! Thanks for the feedback! I may be able to do this. I have your extension installed on my home computer (in Philadelphia, PA) and work computer (in Ambler, PA), both running the latest stable version of Chrome, and both are logged into my personal Google account and synced. I’ve noticed when I come home from work, open Chrome, and click the icon, it shows my work location the first time I click it, then when I click away (close the extension popup), then click again, it has updated to the correct home location. The same goes for when I open Chrome at work in the morning – the first click shows my home location, and the second click shows my work location. It appears there’s an issue where it doesn’t update to the correct/current location until after the first click. Any ideas? The extension will check periodically check for location changes. Most likely you are opening the extension before it has time to update the location. I can look into improving this so it will update immediately. Since updating to version 3.5.92, the toolbar icon no longer shows the temperature or weather icon – just a generic sun/cloud/rain icon. Can you try close your browser and reopen? I closed and reopened Chrome, same issue. comment l’avoir accès a la langue en français ,merci . Dark Sky just released a new website called darksky.net. the old forecsastio.net site mentions this as well. the new site is much nicer than the old site. It would be cool if you were to repoint the extension to the new site if possible. Thanks for the feedback. The extension has been updated to the new site. If you mouse over the day/time you can see C. Showing multiple locations is tough with limited room. I think most are similar b/c they are made for the majority of users. I’m open to any ideas you have. at leased i can look at the weather any day i want! I don’t live in New York, this extension lied to me. Check out the FAQ on how to change your location. Is there a way to test it to see if it works for alerts? Just making sure this site gave the right app. Did you upgrade to pro? If so you could set your primary location to somewhere a rain storm is occurring. Thanks! Would you take 30 seconds and leave me a review?. What url? Make sure your version of Chrome is up to date. Unlike Safari on our new iMac my Chrome browser does not show the time. I noticed that your Weather Extension had it but was ‘x’d over. I purchased Weather Extension Pro, at a greatly reduced price and was able to uncover the time ‘x’ (no pun intended), but I see no time anywhere. Did I misread or is it not available? Not complaining, just asking. I like what I see and will leave a review as soon as I become comfortable with the extension. Thanks. Hey Joe I recently updated the UI of Weather. I plan on adding the time back. Thanks for upgrading! A download page would make this app easier to share. Requesting the Pro upgrade to my account. Sure just send me a message using the extensions contact form. It’s good and what I desire.